It’s rare that the name of a vacation rental could truly summarize the benefits you will find inside, but this one says it all at Serenity. Your holiday should encompass the peace and quiet you need, and at Serenity, you will find that and much more. Whether you are relaxing beside the unique Japanese pond or soaking up the dark wood furnishings that are both hip and modern-minimalist simultaneously, this is one place you will want to come home to again and again. With three big bedrooms, a gourmet kitchen that is perfect for the foodie in your life, and a lush tropical garden as well as a gorgeous pool, Serenity is certain to create the same in your life. Great location - within walking distance to harbor, Shell Beach, restaurants and tax-free shops! 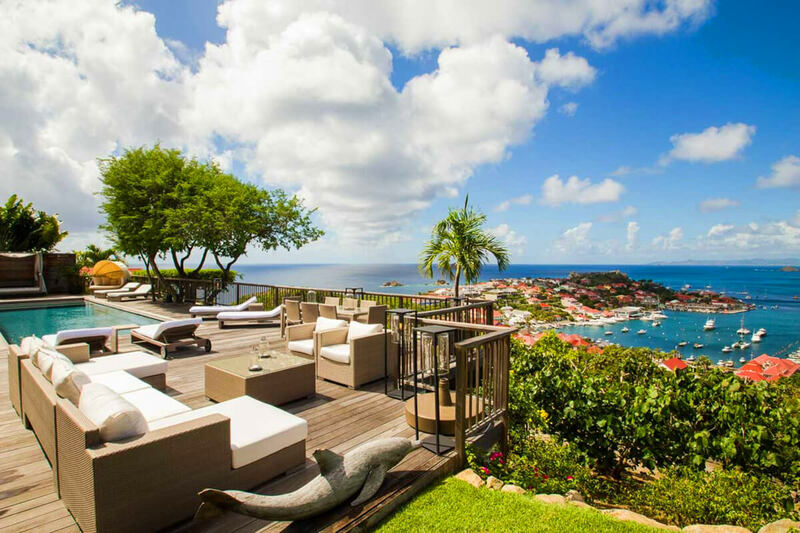 Serenity Villa is a sumptuous villa overlooking Gustavia Harbor in a fantastic location - within walking distance to the harbor, Shell Beach, restaurants, and tax-free luxury shops. Trendy and spacious, it is well-furnished and offers both privacy and comfort, providing sea views from private terraces. The pool and surrounding deck have both sun and shade to please all tastes, and relaxing by the Japanese pond is a must. Dressing rooms, fully equipped gourmet kitchen, flat-screen TV with French satellite (sports, movies, and news in English), parking, garden, wireless DSL internet access, gas BBQ. Prices are subject to change without notice and do not include an additional 10% administrative fee. Christmas/New Year’s rates are provided upon request. Walking distance to Gustavia Harbor and Shell Beach (5 minutes). Guests are met at the airport and guided to the villa. Departure transfers not included.